But can you develop a chest Greek gods would be jealous of with just your bodyweight? Long answer: You ready to work? You can most definitely create the chest you so desire with an arsenal of calisthenics push exercises, and that’s what we’re here for. In this, we’ll give you a full overview of exercises for that thick, manly chest, as well as how to structure your chest workout at home. 1 Why Bodyweight Chest Exercises? Before the age of gym memberships and sweaty locker rooms, there was the great outdoors. Somehow, in the early times, there were those who had unbelievable muscular development, especially in their chest. How was this possible? One word: Calisthenics. They can be done by anybody. It doesn’t matter what level you’re at, you can do these exercises. Push-ups on your knees, your toes, elevated, or one-handed – there’s a push-up for every individual. They can be done whenever, wherever. Today got away from you; it’s 11 PM, the gym is closed, you can’t get your workout in…oh, wait. With calisthenics, you aren’t beholden to a time or place. Get your workout on at the park, at home, in the early morning or late at night. They do more than just add muscle mass. Calisthenic movements allow you to rep a lot of volume. You can do this on your own time, but you can do them quickly and with minimal rest. All this to say, you can rock your strength workout with a little conditioning naturally baked in. You’ll become fitter via metabolic fatigue to go along with muscular fatigue. They keep you healthy and injury-free. These exercises don’t require massive amounts of weights to get the desired effects. You still gain muscle mass, without the heavy bar suspended ominously over your neck. Sound good? As long as you’re loose, you should avoid injuries and stay on track to build that kickass chest. They keep you progressing fast. Calisthenics are simple to record, giving you the tools to move forward with your training. We’ll get more into this in the workout structuring section, but what you need to know is you’ll be going from regular push-ups to one-arm push-ups faster than putting 2.5 lb. plates on either side of a barbell. As a quick note, you can adapt most of the original exercises (push-ups, dips, etc.) to hit all four areas of the chest. For example, with the push-up you can target your upper chest by elevating your feet, or lower by elevating your hands, or inner chest by moving your hands closer together, or outer chest by spreading your hands wide. The cool thing is, with calisthenics you get complex movements that hit multiple areas simultaneously. This is why we don’t need to focus on inner or outer chest; you can simply alter hand placement for most of the exercises and you can focus on one or the other. Keep this in mind when you’re creating your calisthenics chest workout routine. Why start with dips? Because dips – not push-ups or any other bodyweight exercise – is the absolute best for developing a gigantic chest. Plus, they work your triceps, another main push muscle. Dips mostly work the lower pecs, but if you lean forward you get a good neutral workout. How To: Start by holding a pair of parallel bars at waist height. Lift your body up; you should be suspended in air. Slowly lower your entire body by bending your elbows, going straight down. Come back up by contracting your pecs and straightening your elbows to the “locked” position again. Equipment: Either parallel bars or a single horizontal bar. If you’re in the early stages, a bench can suffice. Have you ever seen an article online where you get thirty billion push-up variations? Yeah, this ain’t that. Truthfully, push-ups are tremendous at building different areas of the chest, and this is one of the few instances where you can take a complex movement and target one muscle group over the other. It’s versatility can be paralyzing though; if you start to feel overwhelmed with the amount of ways you can push your body off the ground, just stick to the basic progression, which we’ll show you. How To: For the original push-up, start by putting your hands on the ground at shoulder width, with your elbows close against your sides. Get on your toes. Lower your body to the ground, getting an inch away from touching. Make sure your elbows stay locked in next to your sides. Push back up by contracting your chest and triceps. Keep your back flat throughout the entire movement. Equipment: None, unless you’re scaling; a box or gymnastic rings or something else might be needed for advanced variations. If you want to add extra weight to your traditional push-ups, it would be best to wear a weighted down backpack. Start on your hands and knees. Only push up with your upper body. Go slow with negatives. When you reach the bottom, go to the ground and push back up while on your knees. At this point, the next progression is normal push-ups. Once you can rep regular push-ups consistently, you can do a variety of different push-ups. And there are a bunch of variations. Depending on your fitness goals, you could be doing clapping push-ups, diamond push-ups, or planche holds. Basics are Best. The traditional push-up, performed at different angles (incline/decline) and hand positions (narrow/wide), is the optimal exercise for targeted chest development. The rest are just for show. Great for targeting the inner chest, chest flys are what you primarily use the cable machine for in traditional gyms. However, the bodyweight version adds an element of toughness to the movement – gravity. By using your body as the weight, you’re putting a tremendous load on your pecs to lift your body while flexing together. How To: Set up a pair of gymnastic rings about a foot off the floor. Grab the rings in push-up position; your hands should be gripping the rings, palms facing each other, and your feet on the ground. To begin, lower yourself by locking your elbows and spreading your arms down, so your body looks like a “T” at the bottom. To get back up, flex your pecs and lift up without bending your elbows, back, or legs. For the most tension and flexion, squeeze your arms together and past each other, almost making an “X” with your arms beneath you. Scaling: Start on your knees for this movement. Once you can do them on your knees, start with the rings set higher than a foot from the floor. Continue to progress by bringing the rings closer to the bottom (i.e. using more of your body weight and gravity). When you get to roughly 6 inches or so from the floor, bring your arms closer and closer together, eventually crossing them. This is essentially the farthest progression of this movement; if you want more of a challenge, add weight in the form of a weighted vest. 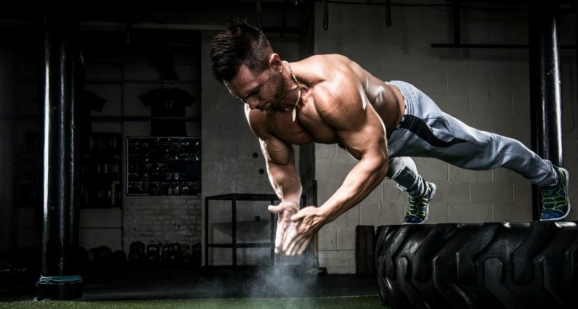 Developing a godly chest via bodyweight exercises is both limited and unlimited. What I mean is, while there are only a handful of structural exercises – dips, push-ups, flyes – there are multiple variations of these movements, which adds to the difficulty and keeps your workouts interesting and fresh. Therefore, your calisthenics chest workout plan will be incredibly simple to follow, but not easy. To wit: Your chest workout will consist of one dip variation and one push-up variation, for a number of sets and reps, ending with a superset of ring flyes. This will fatigue your pectoral muscles and metabolically fatigue your central nervous system, resulting in an all-around taxing workout. Make dips your priority. It develops the pectorals the best, so focus on progressing in this movement. How many reps you can do tells you when to progress where. If you are doing an exercise for 4-6 reps every time, you need to perfect that movement and up your reps. Conversely, if you’re consistently getting 13-15 reps on an exercise, it’s time to progress up the exercise ladder (normal push-ups to archer push-ups or bench dips to negative dips). The last exercise – ring chest flys – is not meant for muscle mass. Instead, keep the reps up in the double digits. You can get a little sloppy at the end of these intense supersets (as long as you stay smart about your abilities). This should drain you of all remaining energy. Both your muscle and your central nervous system should be shot by the end. This is only a sample workout; cater it to your own needs and goals. Amount: 2-3 exercises for your chest, reaching both metabolic and muscular fatigue. Frequency: 2-3 times per week is plenty. This allows for adequate recovery time. Volume: 4-15 reps; The first portion (4-7) develops strength in a movement, while the second portion (8-15) invokes hypertrophy, or muscle growth. Anything above 15 repetitions gets into the endurance type of workout. Time: Doing three chest exercises for 54-180 reps total shouldn’t take longer than 25 minutes, or eight minutes per exercise. Creating a thick, muscular chest can be simple and challenging with calisthenics. Using a few complex chest exercises – with only your body weight for the load – will give you consistent, injury-free muscle growth. You can do this kind of workout wherever, whenever, which means no excuses! Get sore and sweaty with a workout that breaks your muscle tissue down and gets you out of breath. And while there are multiple variations, if you stick to the basics and structure your exercises to your goals, you’ll be unstoppable. Pair this with auxiliary triceps movements two or three times a week, and you’ll have a godly chest in no time! Follow these guidelines, and your chest will attract the attention you deserve. Power up those pecs!